I LIED. I’m staying awake until it’s time for me to go to the airport. Basically pulling an all-nighter to equip myself to Germany-time and ensure I pass out on the plane. 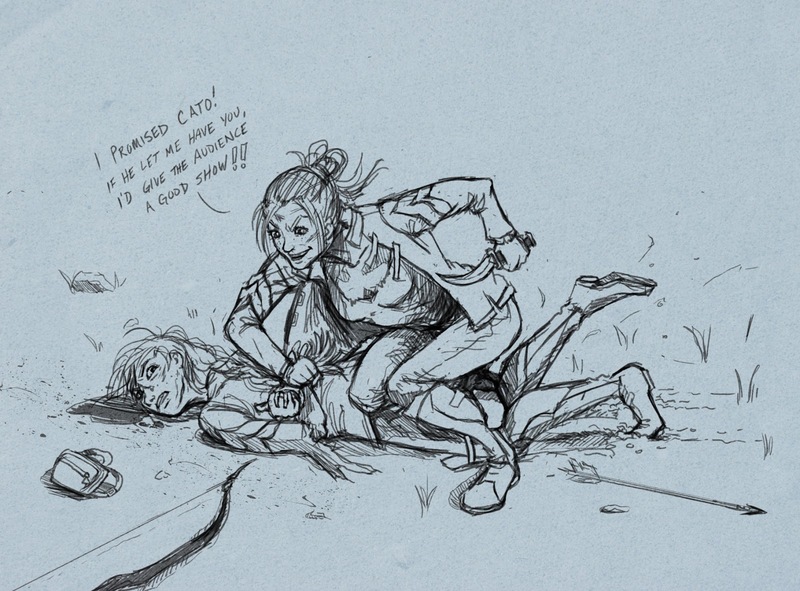 SO MORE HUNGER GAMES SKETCHES IN THE MEANTIME. Here’s Katniss vs. Clove! hey kim! hows it going, its Ruoyu, I see that you have kept up your craft :). I think you are talented and was wondering if you would be interested in doing some simple concept art for a short I am working on. It will be a cg short between 5-10 minutes long. Which is really a heavy workload. right now i am the only work thats working on it. I will be doing some of the concepts myslef but could use more help with extra dose of imagination. YOu can say no of course. But let me know if you are interested in collaborating on a post apocalyptic story.